Available To Promise (ATP) is a feature that allows for stock levels to be displayed in Employee Portal when orders are placed by a Sales User. Configure ATP Settings as described below. Available To Promise (ATP) can be enabled in InterConnect Manager Add-On for SAP Business One. In SAP Business One, go to: InterConnect Manager AddOn > Administration > Employee Portal Order Pad. Enable Available To Promise by placing a check-mark in the lower right section. Set the desired Validation Level: Warning Only will allow Sales Users to continue through checkout. Block Backorders will prevent the Sales User from placing an order where stock levels are out-of-stock. Warning: For OBeer implementations, use the version found under the B1WebAPI_oBeer_EP category. At this point, the website is updated to display ATP for Sales Users in Employee Portal. ATP can be updated with an implementation customization (i.e. modifications to standard B1 queries, which doesn’t require development effort). A B1 expert can update the ATP query using SAP Business One. Out of the box, the ATP Query calculates the default warehouse’s “On Hand + Ordered - Committed” quantities for the item. This behavior may be customized by creating a copy of the stored procedure zed_ItemsATP and updating B1 to use the new version, as described below. Important: Best practice recommendations are against editing the default stored procedure or query. Instead, create copies and point the configuration to the customized versions. See instructions below. ItemCode of the item being queried. CardCode of the current order’s Business Partner. ExpectedDeliveryDate for the current order. In SAP Business One, if it doesn’t already exist, Create a Query Category for custom queries: B1WebAPI_Custom. Inspect the list to see if B1WebAPI_Custom already exists. If not, enter the “Category Name” B1WebAPI_Custom, then press the Add button. Open the existing ATP Query found under B1WebAPI_SU/AvailableToPromise. Save your custom version of the query in the B1WebAPI_Custom category, for example B1WebAPI_Custom/AvailableToPromise. Copy the Stored Procedure in the database and update the above custom ATP query. This will ensure your customized version is never overwritten during an upgrade. At this point, the website is updated to display the customized ATP for Sales Users in Employee Portal. 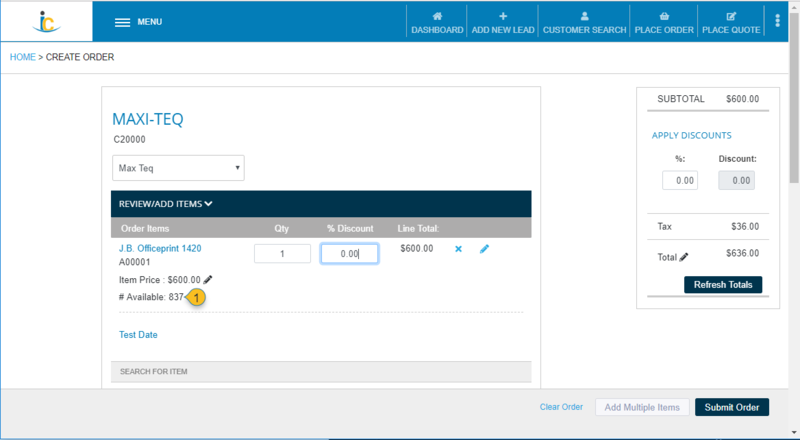 When configured, Available To Promise quantities are displayed on the order during checkout, as shown in the screenshot below.